Today when I got home I had received my new fall update from Paper-Source. I absolutely love their shops, and I am excited to see they are opening a location in Austin next year! In celebration of the upcoming Austin location I thought I would make a top five list of my current favorites at Paper-Source. I think their product has a great balance between sophisticated yet fun. 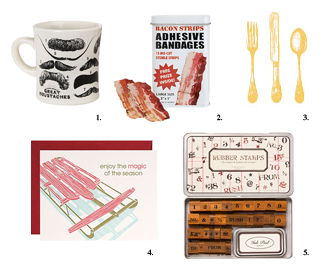 I can't get enough of their rubber stamps, and I love to buy friends surprises from their quirky gift selection. How great would it be to give someone the Great Moustaches Mug; I think it would offer a good laugh. Also, as someone that injures myself more than I would like at work I have a serious appreciation for fun bandages. I wouldn't be able to stop from smiling if I used a bacon bandage to cover a cut.